Nice Two Bedroom & 2 Bath Condominium in town near the Sierra Star Golf Course and the shuttle route to the Eagle Lodge Express Ski Lift Area in Mammoth Lakes. Sleeps up to 6. Ground Floor unit. There is a flat screen TV in the living room. The Master Bedroom has 1 Queen Bed and a flat screen TV. The second bedroom has 1 Full Bed and 1 Set of Twin Bunk Beds.Wifi Internet Access. You enter the unit from the ground floor and it is all one level. There are 2 outside parking spaces available. There is a game room with a billiard table, a ping pong table and a video game in the lobby of the Sunshine Village condos. In the summer you have access to BBQ areas throughout the complex and a Tennis Court near the swimming pool at Sunshine Village. Coin-operated laundry facilities located in the common area near the office. TOT LICENSE 3390-SV137. This condo was spacious and well worth the money. It is located at a perfect distance from the village, bike park, and grocery store. We enjoyed the fireplace in the living room. There are couple of minor issues to keep in mind though, It is a first floor condo which means you will hear people above you when they move, take showers or even talk. Also the bathrooms are carpeted and that was a little bit of a shocker, but nothing that would stop me from booking again in the future. Great location that accommodates a good number of people. Recommended for a family with kids. We had a great stay at 137 Sunshine Village. The condo was very clean and spacious. I would definitely consider staying there again. 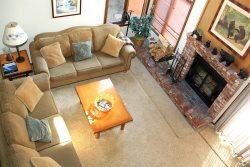 The condo is in a great location; close to Vons as well as many other shops and restaurants in Mammoth. We were very pleased with how clean, well kept, and spacious the unit was. The price was very reasonable as well. Everything was great. The condo was cozy and clean. Good location in town.